After driving all over L.A. and Orange Counties yesterday to visit friends, I’m taking it easy today. Here’s a cool Labor Day poster, especially for those of us who work for government. 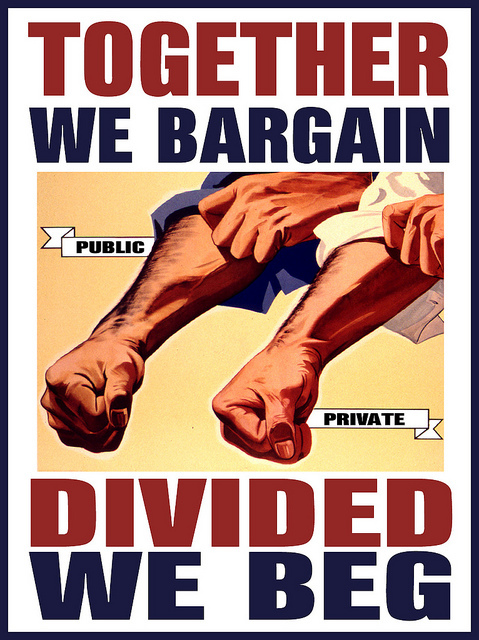 Enough of the attacks on public sector employees and the small subset of us who are still unionized! Solidarity forever. Here’s something I heard while driving around what Southern Californians apparently call “the Southland.” (Maybe it’s just because I’m an American historian and a professional Yankee by birth, inclination, and residence, but I’d never call anyplace I live “the Southland.” Just sayin’. ): a hilarous segment from Latino USA: “The Worst Latino.” Well worth a hearing for anyone who’s ever felt like an inferior member of an ethnic group, political movement, religion, or whatever. It’s all about interest group boundaries, and how they define us and bring us together as well as potentially alienate us. I met you last year at WAWH, I’m the PhD candidate at UC Irvine Mawrtyr who awkwardly followed you around for a while. So many reactions to this post! 1) Happy Labor Day and welcome to Southern California! 2) I am the worst EVERYTHING. I’m the worst South Asian woman, the worst member of the disability community, and the worst feminist. I could go on, but why bother? Fact is, I only beat myself up over the elements of my identity that matter most to me, which is why I think it’s easy to laugh at clips like the one you shared. Enjoy your time in California! Hope to see you again soon! It’s not “Southland” I hate. Hi Andrea–You must be a pretty bad South Asian, because I didn’t realize that you were South Asian! I’ll be in Irvine in early October for a guest appearance in one of Sharon Block’s classes, so perhaps I’ll see you then? Congratulations on the blog–I agree with your evaluation of “best” grad students being the most overworked and most martyred to the cause. It’s something to avoid, for sure. As for bad feminist: join the club! It’s almost as big as the club for bad women.